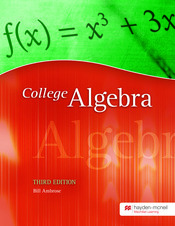 The author’s main objectives in writing this text were to (a) write a book that students can easily read and understand and (b) stress problem solving as a means of understanding the topics traditional to a college algebra course. Example problems have been worked out in detail to emphasize both the theoretical and computational aspects of the topics covered in the text. “Check Your Understanding” problems, additional examples, and end-of-the-section problems are placed throughout to enhance students’ comprehension. This text includes additional material to permit instructors to select topics most relevant to their pedagogy and curriculum.